Our Mother of Perpetual Help – Cretan, 13th or 14th century. Today, his particular image is found pretty much anywhere there are Catholics. 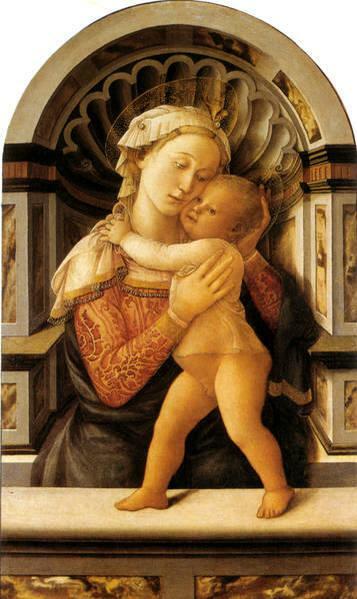 Madonna & Child, Lorenzo Monaco, early 15th century. Modern icon, probably a copy of a copy of the 12th century Virgin of Vladimir. Five colors are prominent here: red, blue, black, white and gold. 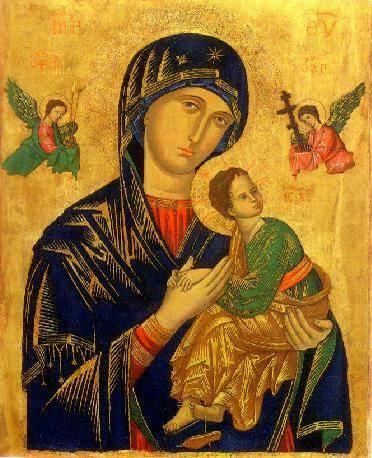 The first image, Our Lady of Perpetual Help, is one of the most copied works of art in history. The virgin is shown wearing a red gown and a dark blue to black cloak. Centuries later, Filippo Lippi paints Mary in a contemporary red dress, again cloaked in blue running to black. 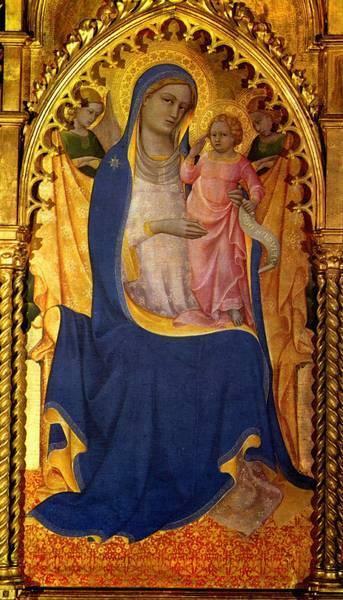 Lorenzo Monaco painted a little earlier than Lippi – he introduces a white gown with gold trim, and uses a much lighter, more vibrant blue for the cloak, lined with gold. 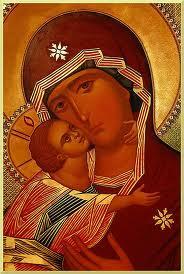 Finally, the contemporary icon shows the Virgin in a red cloak lined in dark blue. The presumed original had Mary wearing a black cloak with gold trim. These 5 colors – red, blue, black, white and gold – are highly symbolic. Imagine living in a world before not only television and color copiers, but before few but the wealthy could afford to dye their clothing brilliant colors. (The modern chemical industry evolved from efforts to manufacture bulk dyes and tan leather – that’s another story.) The most common places to see such strong colors was nature, so that such a color carried with it the meanings absorbed from how it occurred in nature. People living centuries ago felt those meanings much more strongly than we moderns do. Therefore, blue is associated with the sky; dark blue and black with the night. Red is the color of fire and blood. Fire was the strongest force known – it could melt metal, destroy towns and forests, and, under control, warm the home and cook dinner. Gold is a fleeting color of sunset and the setting sun itself, and also the color of the precious metal handled only by the wealthy and by priests, when they used sacred vessels while offered the Mass. White is the color of pure milk, snow, the noonday sun – it was the color against which any impurity would easily be seen. Further, the objects in the natural world from which colors draw their meanings also have relationships with one another. The most obvious is that the sky envelops the earth, and is the dwelling place of the sun, the moon and the stars. The sun gives life, warmth, joy to the earth. The night, when peaceful, lays a quiet, watchful hand on everything, and is the source of longing for the light when people are assailed. Fire, sharing the color and power of the sun, shared also in the divine and life-giving meaning, excepting that fire, unlike the unreachable sun, is immediate and usable. Blood, being life while within us and death when it escapes us, has a derivative relationship to the power of the sun and fire. The Virgin Mary is called the Mediatrix, the mediator, because God chose her to be His Mother. By her acceptance of that role – “Behold the handmaid of the Lord. Be it done unto me according to thy word.” – she became forever the channel through whom the grace of God in the Person of Jesus Christ flows into the world. Yet she never presumed upon her power – she was always humble. The iconographers chose colors with this in mind. Therefore, one right color for Mary’s gown had to be red for power, like fire, sharing in the unapproachable glory of the life-giving sun. But, since she is still a human being, she cloaks the glory she has been granted either in the blue of the sky or the dark of the night. Her power is totally derived from God and in essential ways hidden. Or her gown could be white with gold trim, for purity and royalty – she is named the Queen of Heaven in both Eastern and Western liturgical tradition. It’s tempting to dismiss the last icon, where Mary is dressed in red exclusively, as a modern accident. After all, the presumed original depicts Mary in black – her power is entirely cloaked. But it is not uncommon, especially in the east, to show Mary all in red. I think it’s a matter of what the artist wanted to emphasize – her power (red) or her humility (black). The Mother of Perpetual Help icon is clearest – it just gives a hint of the power peaking through. Other colors have meaning as well: Brown is the color of earth, humility, wood, and so appears often in the clothing of saints. Green is the color of life, grass, leaves, growing grain. It is used often on angels. (Angels seem to be one area where artists cut loose a little, as you can find angles in a variety of colors even on the most traditional icons.) One color commonly avoided was orange – neither red nor gold, it seems just confusing.